We were quite surpised to see snow as we reached the Seorak Sun National Park entrance, since it was spring. Our tourist guide told us we were lucky that it rained the night before and that it was a bit weird that it snowed. But we definitely enjoyed the snow(as we always do) and after taking a 15-minute walk into the park, we went on the cable cars up to it's viewing deck. The park was very beautiful and the mountains covered in snow were just breathtaking, masyaAllah<3 I really loooved this place, a place you most definitely wouldn't want to miss should you visit South Korea in the future. After spending about an hour on the viewing deck, we went back down via cable car and visited the Sinhueng Temple, also located within the Seorak National Park area. Situated on the slopes of SeorakSun, there was a huge bronze Buddhist statue which was well over 15 meters high (that's approximately the height of a 5-storey builing). The statue is very important to the Koreans because it is a symbol of the people wanting the reunification of their divided country. 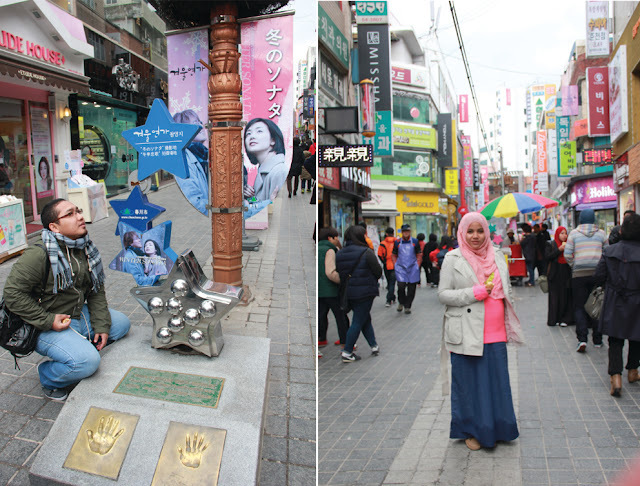 We had our lunch at a nearby halal food restaurant and performed our zuhur+asar prayer(jamak taqdim) before trasnferring to Nami Island via ferry boat, situated in the Gangwon province. The ride was very short since the Island wasn't that far from the mainland anyway. 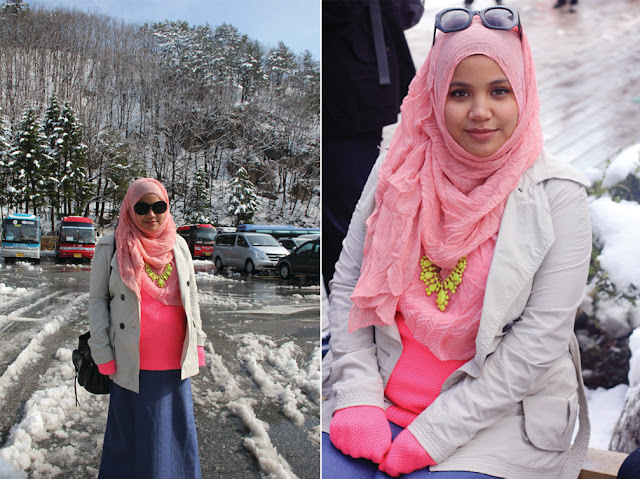 Afterwards, we also visited Myeongdong, the famous shopping street in Chuncheon where 'Winter Sonata' was filmed, had our dinner, checked into our second hotel at Vivaldi Park and called it a day..
cam titanic pulaa... happy slalu tuk akak..
That bright pink top is so gorgeous! Oh my... The food looks delicious! Salam akak..what is your lens colour? It does suit you and look very au naturale hehe. Btw u seemed to have a very good time overthere. Enjoy ur pregnancy and may Allah ease everything. Beautiful... I miss Korea so much.